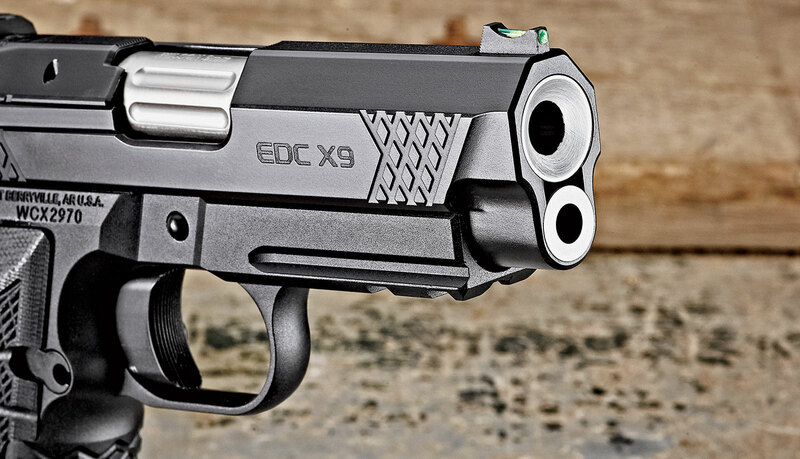 The EDC X9, like the upgraded Nighthawk, is a double-­stack 9mm 1911. First reviewed in G&A’s October 2017 issue, the EDC X9 was designed primarily to be a compact, easy-­to-­conceal, everyday-­carry gun. Unloaded, this sleek semiauto weighs just 29.3 ounces. 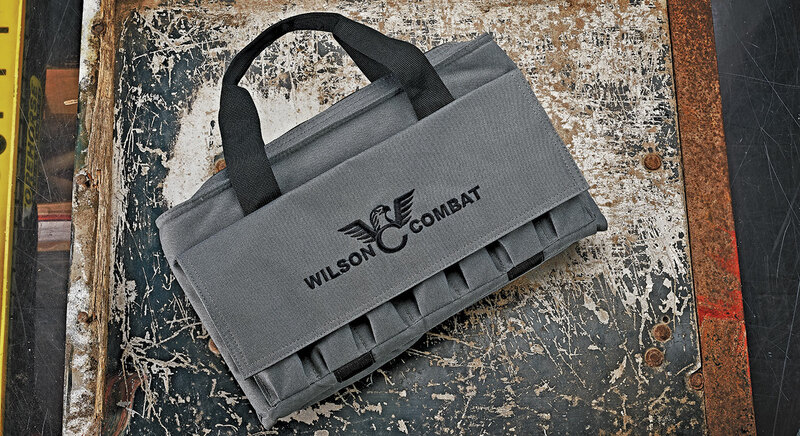 Most of the weight savings is courtesy of Wilson’s compact X-­Frame, which is made from lightweight T6-­7075 aluminum. One of the benefits of the X-­frame design is that it’s smaller in circumference than other 1911 grips, yet it accommodates the same controls. The mainspring housing, frontstrap and front and rear slide serrations received Wilson’s X-­TAC crosscut diamond texturing. The G10 grips feature a starburst design and pewter WC-logo medallions. Despite being a double stack, the EDC X9 still maintains manageable proportions. Overall height of this pistol is just 51/4 inches and width at the base of the grip is 1.4-­inches, just one-­ to two-­tenths of an inch wider than most single-­stack 1911s. So, grip geometry is superb. The EDC X9 fills the palm and remains locked in your grip while shooting. The trigger only required 3 pounds, 7 ounces to fire making it far superior to just about anything you’ll encounter on a dedicated carry gun. 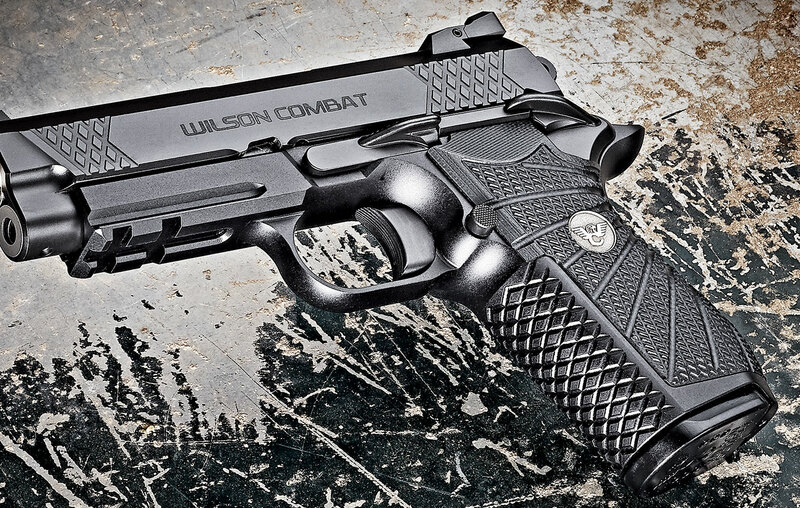 As you might expect from Wilson Combat, this pistol came with a long list of standard features including the company’s concealment Bullet Proof hammer, thumb safety and magazine release. The stainless steel, bushingless barrel is 4 inches in length, and given a flush-­cut reverse crown. Both the barrel and chamber are fluted part of the way, which is a small benefit in keeping overall weight to a minimum. The top of the slide received 30-­lines-­per-­inch (LPI) serrations while the rear of the slide sports 40-­LPI serrations. Underneath, the EDC X9 has an optional accessory rail for lights or lasers. Wilson’s tactical battle sight is dovetailed into the rear of the slide, which is also screw-­adjustable for windage and elevation. The fiber-­optic sight up front appears durable and easy to see. It may or may not fit into your favorite 1911 holster. That will depend on the depth of the sight cutout in the holster. The EDC X9 comes with carry cuts and ball end-mill cuts. The black, Tri-­Top stainless steel slide features Wilson’s Armor-­Tuff, thermally-­cured finish and a stout external extractor for reliablity. Given its fighting gun personality, I guess that I didn’t expect the EDC X9 to match the larger guns in terms of accuracy. But this compact-­carry 9mm performed exceptionally well. The U-­notch rear sight and fiber-­optic front are quick for the eye to pick-­up, and the grip helps keep this gun firmly in control while firing. The EDC X9 held its own against the guns with a longer sight radius and lived up to its sub-11/2-­inch promise when fired at 25 yards. There were no issues throughout G&A’s test and the EDC X9 proved (again) to be a great gun for combat-­style shooting, especially between 5 feet and 15 yards. The X9 also had some features that, while relatively minor, helped the gun stand out in this ultra-­competitive field. First, the G10 grips are angled at the top and offer a perfect index or rest for the thumb of your shooting hand. Also, the Bullet Proof magazine release was the easiest of all the guns to reach and manipulate, which is exactly what you want for carry. 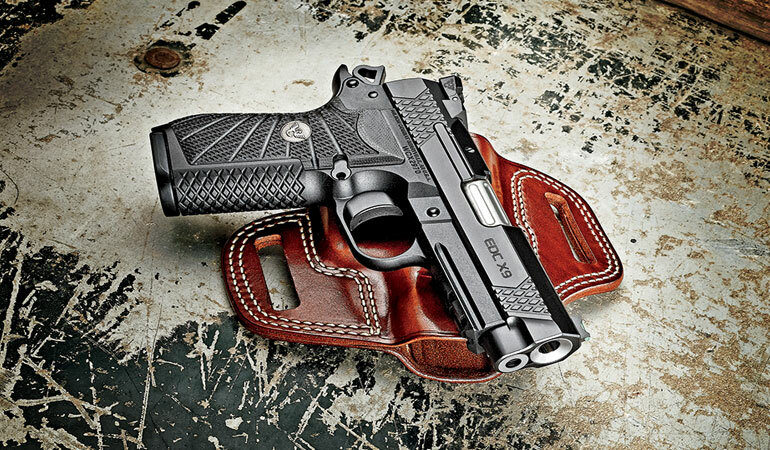 If you’re in the market for a reliable, concealable, defensive sidearm and aren’t put off by the Wilson’s $2,895 starting price for the EDC X9, then you won’t find a better pistol than this.